This year is the 800th anniversary of the signing of the Charter of the Forest. It was a companion document to the Magna Carta and this charter re-established the rights of commoners to free access across land that had been taken away or “afforested” by the Norman kings. In this period, a “forest” was a place of hunting, not necessarily a place of trees. It included heathlands, grasslands and wetlands. The word “forestis” was originally a medieval legal definition declaring an area under the King’s law. It is referring to being outside (Foris) the common law. It was only in the 19th century that forest became synonymous with “plantations”, and later the birth of the Forestry Commission in 1919 as a new timber industry evolved in place of the older traditions of coppicing with standards. Not many people realise, but virtually the whole of Cornwall and Devon were designated a Royal Forest under the reign of King John to hold rights over access and hunting. This caused widespread resentment since the people previously had rights to graze, to forage, to pannage [allow pigs to feed on acorns], to hunt and to take wood. Such was the opposition that in 1204 these areas were “disafforested” and only the more open Dartmoor and Exmoor were retained as Royal Forests. 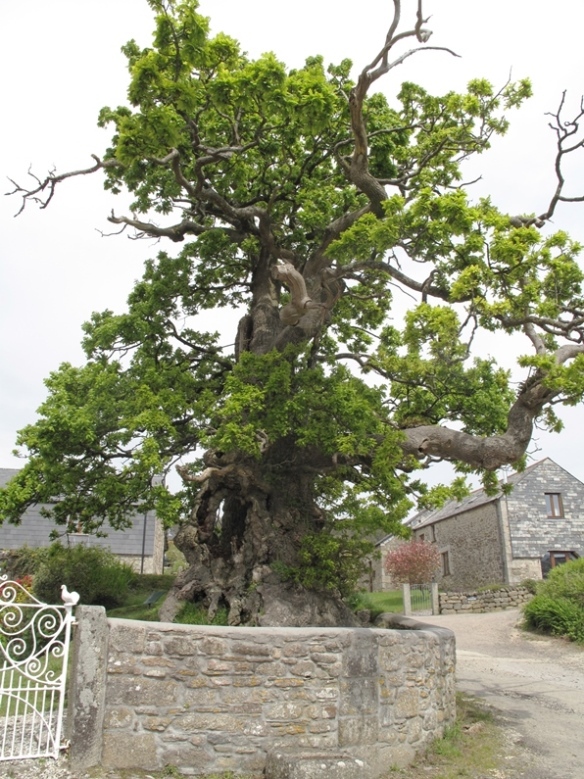 In Cornwall, the Darley Oak near Upton Cross, may be the only ancient tree to have survived from that period as a Royal Forest. In other parts of the country, the Forest protection was more continuous such as Epping and Sherwood Forests and many more ancients survive. However, the Norman lords and Earls were so keen to hunt the deer, they introduced the fallow deer and sought permission to “empark” special areas within their lands with banks and cleaved oak planks called a “park pale” to keep the deer in. With the Kings permission these became protected reserves for sole use of the landowners and their guests for deer hunting. Cornwall had at least 18 hunting parks, including Restormel and Boconnoc, many of which have survived in some form until today. These have become the sanctuary of valuable ancient trees because they were keenly protected. The very oldest trees have a huge range of associated wildlife, which can include ferns, birds, bats and fungi as well as a hundreds of associated insects and other invertebrates. In his new book, Aljos Farjon states that England has 126 living ancient oaks of 9m girth or more while the rest of Europe including Scotland and Wales has only 97 (A 9m girth tree could be 850 years old). We are now the stewards for a hugely important landscapes and ancient trees of immense biodiversity value. The landscapes in which these grew were typically wood pastures with some woodlands, not dense forests, and these led to the wide spreading open grown oaks we recognise today. 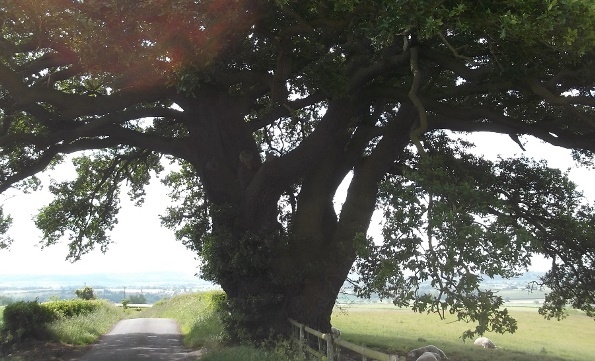 The Drayton oak, Shropshire, with a 9 metre girth. Photographed on an ecological survey of the Raby Estate.